Governor Jay Nixon (D) is calling on the legislature to reject a Senate plan to change how three state agencies that deal with health and welfare programs are funded, and cut $130-million from them. That plan would lump most of the funding for the departments of Health and Senior Services, Social Services, and Mental Health, together, reduce by 4 to 6 percent the new appropriation to each of those agencies, and then give those agencies flexibility to decide how to divide their funding among their programs. It was proposed by Senate Budget Committee Chairman Kurt Schaefer (R-Columbia) who said it would slow the steady year-to-year growth of the budgets for those agencies, who he said haven’t been spending all the money allotted them. 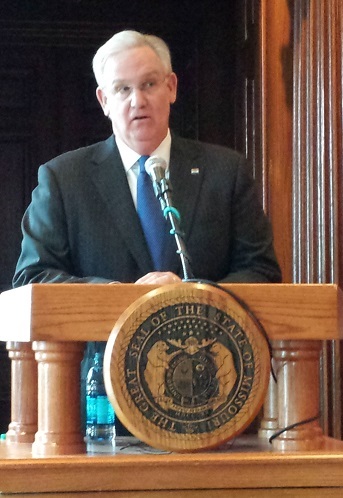 Governor Nixon said proposed reduction to those agencies, when combined with federal dollars, would amount to a $300-million dollar reduction in their appropriation. Schaefer says that’s inaccurate. Nixon called the proposed reduction “draconian,” and told reporters Friday he is revealing a plan meant to make those cuts unnecessary. “Revenues have come in above initial projections and the legislature has passed tax amnesty [legislation], that will provide even more dollars to support state services. As a result, we can provide additional funding to public education while also protecting vital services for vulnerable Missourians,” Nixon told reporters Friday. Nixon submitted a proposed budget amendment that would add $80-million in general revenue funding for services at those three agencies. “This additional $80-million in general revenue coupled with the additional $70-million in general revenue that the Senate set aside in its proposed budget will, when matched with the additional federal dollars, fully restore the $300-million in unnecessary cuts,” Nixon said. The legislature passed tax amnesty only after an agreement was reached to put that money toward adult dental Medicaid coverage. That legislation is still awaiting action by Nixon. Lawmakers from both the House and Senate are set to begin next week attempting to work out differences between the budget proposals from each.